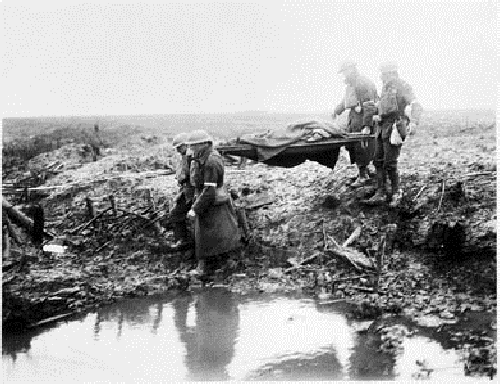 Passchendaele is one of the battles of the Great War that brings images of the worst that this war presented: mud, cold, and above all, the horror of fighting over previous battle fields with all the hideous discoveries that this implies. The Battle had been going on since 31 July. 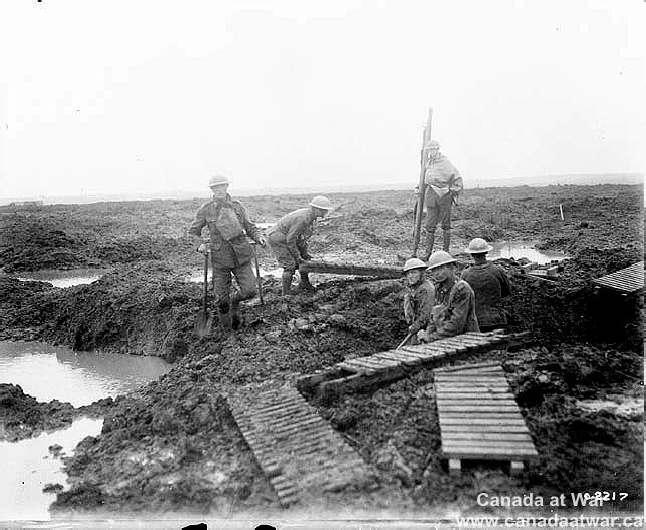 The Canadians, 100,000 strong, were ordered into the Battle in mid October and immediately set to improving roads, trenches, gun pits, tramlines —all under fire from the Germans on the Passchendaele ridge. Rum arrived in the trenches weekly in gallon jars labelled SRD (Special Red Demerara 86% proof) Jamaican Rum. It was issued to fortify morale. Battalions in the trenches will in future ration with rum or pea soup (according to which is issued) those Machine Gunners of a Reserve Battalion who are stationed in support of each Battalion in strong points. 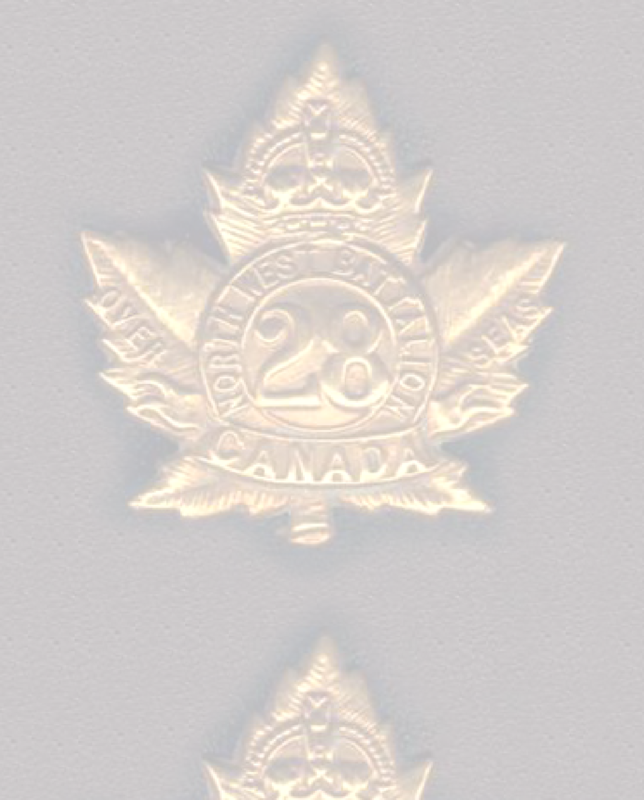 It is distinctly understood that the Machine Gunners referred to above who are under the orders of the Battalion which they are supporting, will on no account be issued with rum direct by Brigade Headquarters, and, further, that the Machine Gun Section of the other Reserve Battalion is not entitled to rum. 10 Nov 28th Battalion moved to rear area. Promotions and selection in Army situations were rarely a simple means of volunteering for them. 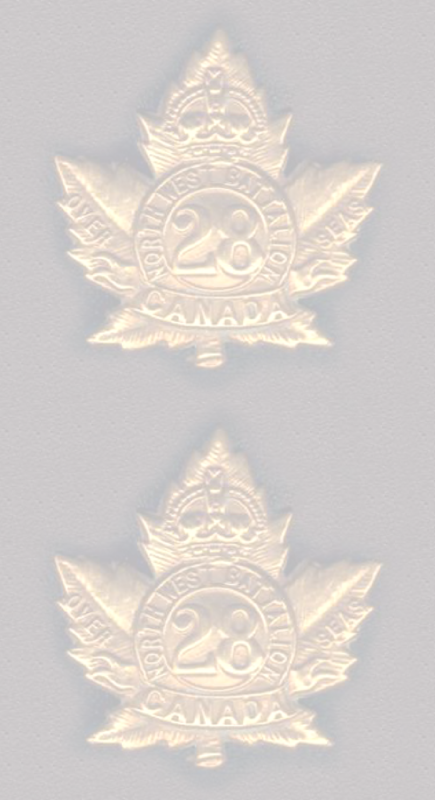 Usually movement in ranks, especially if upwards or to positions with greater responsibility were accomplished by ‘being volunteered’. It is likely that WLH achieved all his promotions (Lance Corporal, Corporal, Sergeant, CQMS) in this way. It is also likely that he was recommended for Officers’ Training by the same means. Trench Diseases: It has to be noted that without antibiotics, simple diseases could easily become severe. Add to this unsanitary conditions, rats, decomposition, body lice and crowded conditions, transmission of disease was easily done. Trench Fever: A moderately severe disease caused by body lice. Symptoms include headache and fever that may recur several times, sore muscles, bones, and joints; and outbreaks of skin lesions on the chest and back. Recovery took five or six days. Trench mouth: Caused by bacteria in the mouth as a result of poor dental hygiene and smoking, it resulted in bleeding and ulcerated gums. Treatment was for the symptoms only. Trench nephritis: symptoms included breathlessness, swelling of face or legs, headache, sore throat and kidney/urinary infections. Treatment was for symptoms only. There was no treatment for the disease itself. Bathing parades were therefore important and held as frequently as practicable– usually fortnightly. It was still the soldier’s responsibility to keep himself clean and well shaven, even in the trenches. Bathing was done in water available, streams, rivers or as a sponge bath out of a helmet if they were in the front lines. Where formal bathing parades were possible, local bath houses may have been utilised. Or a mobile bath tent was erected. Men left their clothes as they entered and collected them again as they emerged. If they were very lucky the clothes had been fumigated in the interim. Men bathed in portable canvas baths and no doubt the water was used several times. page 9 for a good description of mobile bath houses.